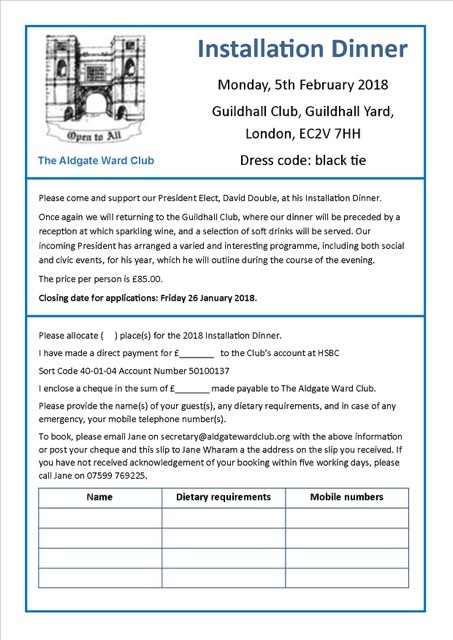 The Aldgate Ward Club | "OPEN TO All"
If you work or live in the Ward or if you are just interested in the City of London, come and join our members who come from many professions and walks of life for some great events and networking opportunities. As our motto says, we are “open to all”. Our social and more formal events offer the opportunity to network and meet others in a friendly environment. Take a look at our calendar of events which includes both formal and informal occasions to suit all tastes. Why not come along and join us and become part of our world-class, vibrant City? As our motto says, the Aldgate Ward Club is “open to all” and we welcome anyone, whether you work in the area, live there or simply have an interest in the City of London. The Ward is a vibrant and active business hub, with many important City businesses and institutions. There are 25 Wards (voting districts) within the City. Each elects an Alderman and a number of Commoners (a list of ours is on the Officers and committee page) to represent them in the Court of Common Council (the City of London’s “town council”). Through our members of the Court of Common Council, we take an active part in the administration of the City. Two of our Past Presidents have also been Lord Mayors of London. The Ward Club celebrated its 100th anniversay in 2006, but before that it was known as the Aldgate Ward Ratepayers Association and its history extends way back into that of the City. It started as a forum for local residents, merchants, traders and others with an interest in the area to make representation to the Ward’s Alderman and Commoners, but now it also has an active social and networking role for anyone with an interest in Aldgate or the City. The Ward is also known as the “shipping Ward” in the City due to the presence of the Baltic Exchange and it being the centre of the shipping business with worldwide importance. There are many other important landmarks including the London Metal Exchange, the “the Gherkin”, Lloyds Register of Shipping and our Ward Church, the Guild Church of St Katharine Cree. Our members come from many City and other professions and walks of life – we are truly “open to all”. The Club is administered by its officers and committee – to find out more about our Committee and its functions click here. On the right is Alderman Prem Goyal OBE JP, a very active member of the Ward Club’s Committee, until he stood down following his Aldermanic election, congratulating David Double on his Installation at the Club’s AGM and Dinner on 5 February 2018 as the Club’s President and David congratulating Prem as the Aldermen for the Ward of Portsoken. 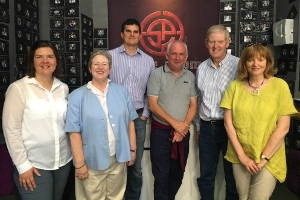 One of the teams taking part in an Escape game held on Saturday morning followed by a relaxing lunch. The City Ward Motes are on Wednesday 22nd March at Noon and ours will be in the usual place at St Katharine Cree. This is election year and for all Wards with contested elections, the Poll will be on Thursday 23rd March. However, Aldgate is one of only six Wards, which is not contested (the others being Aldersgate, Bassishaw, Bishopsgate, Broad Street and Tower). Chris Edge, stepping in as interim President at the Civic Lunch with 3 days notice. A full list of Past Presidents of the Club (from 1907) can be found here. 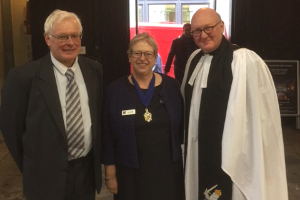 Our Ward Church is the Guild Church of St Katharine Cree, situated in Leadenhall Street. The Parish was formed in 1473 and the Church is named after the same St Katharine whose name is also given to the “Catherine Wheel” which is such a popular firework on bonfire night. There are a number of old festivals and traditions associated with the Ward. St Katharine Cree is the focus of the mediaeval ceremony of “Beating of the Bounds” which has been revived in recent years. One of the Club’s annual October events is the preaching of the “Lion Sermon” which commemorates the “escape” of Sir John Gayre, Lord Mayor and Fishmonger, from an encounter with a lion in 1646 whilst travelling. Today the Ward is home to one of the most important financial centres in the world and to London’s long-established maritime industry, including the historic Baltic Exchange and Lloyd’s Register. The Baltic Exchange’s old building in St Mary Axe was destroyed by an IRA bomb on 10 April 1992 (when 3 people died) and has been replaced by the Swiss Re “gherkin”, now one of London’s most striking and well-known landmarks. The Baltic is now next door to its former site at number 38 St Mary Axe. The Ward Club traces its history back over three centuries. It started as the Aldgate Ward Ratepayers Association and was established to represent residents and businesses with Parliament and the Metropolitan Board of Works. Supporting our President Elect, David Double at the Guildhall Club on Monday 5th February 2018. The City of London combines its ancient traditions and ceremonial functions with the role of a modern and efficient local authority, looking after the needs of its residents, businesses and over 320,000 people who come to work in the ‘Square Mile’ every day. Among local authorities the City of London is unique; not only is it the oldest in the country but it operates on a non-party political basis through its Lord Mayor, Aldermen and members of the Court of Common Council. 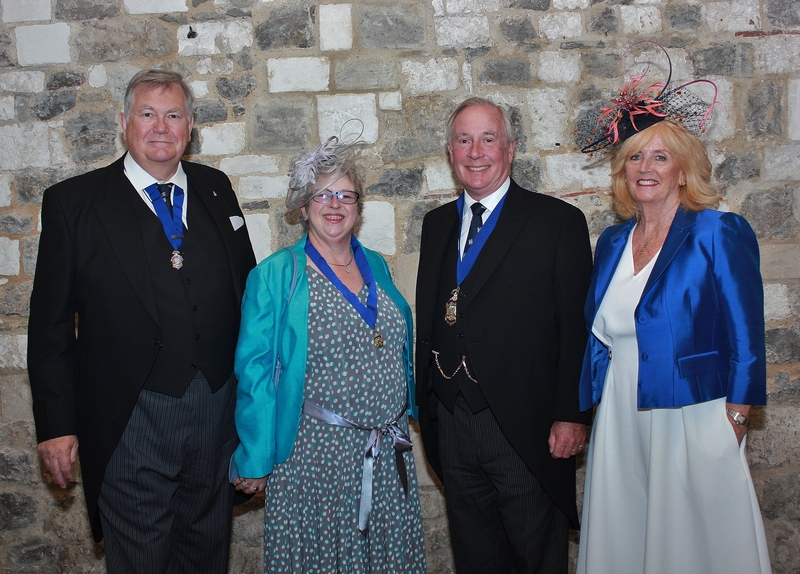 The Lord Mayor in particular plays an important diplomatic role with his overseas visits and functions at the historic Guildhall and Mansion House for visiting heads of State. For more information, please visit the City of London web site from which this extract was kindly provided. Copyright © 2018 Aldgate Ward Club.